Are you planning a community event or a grand opening, sponsoring a field day, conference or symposium? The VCE Master Gardener volunteers will take their show on the road! Comfortable manning an information booth or strolling among crowds, these highly trained volunteers are eager to answer questions and problem solve on any number of horticulture topics: houseplants, vegetable gardens, erosion control, healthy landscapes, insects and bugs, and everything in between! 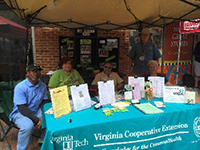 You can also find VCE Newport News Master Gardeners at many local events like the Children’s Festival and the Fall Festival of Folklore. Schools, hospitals, parks, places of worship, private businesses, and individual communities are just a few examples of where a community garden can be found. The Extension Master Gardeners have information which will help your dreams of a community garden come true. We can also assist with planning or designing your garden or in the education of those working your garden, steering you down the path to a successful bounty. Just remember, when you plant your veggies you will need flowers for the pollinators! The 2019 Go Green Expo: Water Wise 757! Date: September 7th, 2019! Come join us! 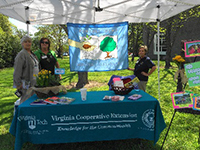 Since 2008 Virginia Cooperative Extension and the VCE Newport News Master Gardeners have sponsored a Go Green event. From the first event, Go Green-$ave Green (held at the Virginia Living Museum with 80 participants), to today’s premiere gardening event on the peninsula, the Go Green Expo has grown by leaps and bounds. The event has moved to the Brittingham Mid-Town Community Center where upwards of 1500 visitors learn about sustainable landscape management. This family friendly event showcases alternative lifestyle opportunities, empowering us to make educated choices in the way we live our lives. Go Green Expo will be held in September … go to Go Green! (http://www.nngogreenexpo.org/) for all the details. Best of all: it’s free! Designed in the shape of a clown’s face, this garden located in Riverview Farm Park provides a unique educational opportunity for families to have fun while learning about nature and the environment. Visit http://www.nnmastergardeners.org/ to download 5 garden activities. This garden was developed and designed by Master Gardener Yvonne Tung. Yvonne has since passed but the joy and peacefulness of the Grin & Grow Garden continues. Have a question about your plants or the insects eating them? Located in the Newport News office of Virginia Cooperative Extension, the Horticulture Help Desk is a free service offered to residents in Newport News. Manned by Extension Master Gardeners and the ANR/Horticulture Program Assistant, calls are accepted between 8:00 a.m. and 5:00 p.m. during office hours. All information is research-based and backed by Virginia’s two land grant colleges: Virginia State University and Virginia Tech. Giving and receiving flowers is guaranteed to put a smile on anyone’s face. The Horticulture Therapy Program at the James River Convalescent Center does just that for both the resident and the volunteer. 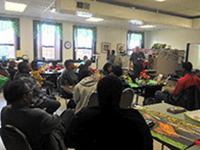 Every Friday morning, residents gather at JRCC to arrange flowers, play garden word games, sow seeds, plant plants, or to eat the watermelon grown in their courtyard garden. They have a courtyard garden? Yes! And all of the plants, with the exception of the trees, are in pots and handicap accessible. It’s one amazing garden. 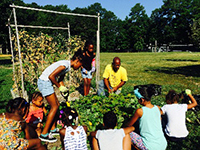 This after school and summertime program at two area Boys and Girls Clubs brings neighborhood children together to garden. All aspects of vegetable gardening are covered; from soil preparation, planting, weeding and watering to harvesting the produce they have grown and nurtured. The Newport News Master Gardener Association sponsors two plant sales during the year: one in April at the CNU Garden Symposium and one in October at the Newport News Fall Festival in Newport News Park. Money raised from these two sales is used to sponsor Newport News children going to 4-H Camp in Jamestown and for the Rita Hubbard Horticulture Scholarship which supports a college student majoring in horticulture. Feel good knowing your dollar will make a difference in the lives of folks in our community. Plus you will have the added benefit of owning a plant nurtured and grown by an Extension Master Gardener! This popular program began in 2009 as a partnership between Virginia Cooperative Extension, the Newport News Master Gardener Water Stewards, and the City of Newport News Waterworks. Since its inception, over 900 rain barrels have been built. Workshops are offered in February, March, April, May, June, and September. Registration is required and there is a fee of $70.00. 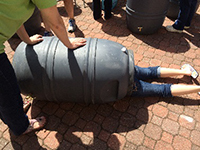 You will actually build your rain barrel at the workshop! Installation is up to you, but you will receive “how to” instructions. Space is limited, so register early. School-aged children learn about plants and how they grow with programs that are tailored to the age group. After a short lesson on the life cycle of a plant, kids roll up their sleeves and get their hands in the dirt potting soil and planting seeds. This “make and take” activity is a hit since each child takes his/her planting home. Planning an event and need a speaker? Virginia Cooperative Extension Agriculture, Natural Resources and Horticulture has an extensive list of topics from which to choose. Go to http://www.nnmastergardeners.org/ for a complete list of available topics. 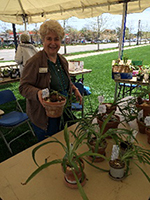 MG Plant Sale: 10:00 a.m. - 5:00 p.m. each day. 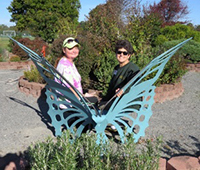 *For more programs taught or sponsored by Newport News Master Gardeners click here. This year the Walmart Foundation announced its continued support of 4-H Healthy Living programs with a new $2 million donation to expand the Walmart 4-H Youth Voice: Youth Choice program in Virginia and 20 other states. This new gift will allow the Walmart 4-H Youth Voice: Youth Choice program to expand its reach from 15 to 21 states across the nation, reaching nearly 75,000 at-risk youth and their families with interactive education about nutrition and food security challenges. The Wal-Mart foundation has been a strong supporter of 4-H Healthy Living programs for several years having granted $4.3 million to 4-H since 2009. The Newport News office of Virginia Cooperative Extension, Family & Consumer Sciences is interested in obtaining passionate individuals that want to hone their skills while working with the diverse residents of Newport News and Hampton. Volunteers are needed in the area of family financial management, youth nutrition and money smart, campaign coordinator support, volunteer coordinator support, senior educators (older adults), GED tutors for adult and youth. Registration cost include: the price of comprehensive educational manuals and CD's, tote bags, aprons for Master Food Volunteers only, food used in class demonstrations for Master Food Volunteers only, name badge or button. Please contact Sonja Mitchell at sonjatm@vt.edu or 757-591-4838 if interested. All kids can join 4-H, boys and girls, kids in grades K-12, in all counties in the U.S., on military bases all over the world, in cities, suburbs, small towns, in the country, and on Reservations. 4-H means to you bet active experiental learning, learning by doing, youth are leaders, youth are volunteers, and kids pick their own projects. 4-H has lots of projects: photography, technology, leadership, animals, horticulture, health, citizenship, nutrition, clothing, rocketry, woodworking, entomology, and arts and theatre. 4-H youth are cared about and feel a sense of BELONGING, influence people and events through decision-making and action-exercising INDEPENDENCE, learn skills to make positive career and life choices - a sense of MASTERY, and learn that helping others through community service is important - experiencing GENEROSITY. The 4-H Clover means the projects are fun, kids are actively involved, there is quality curriculum, the program is educational and the leaders care about kids.